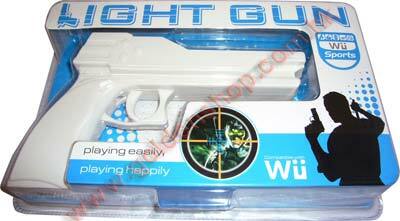 Overview : Playing shooting game with this Wii Light Gun. You can feel the sense of authenticity, just aim at the target on screen and shoot it down. So Easy! Quality/Usability : Every gamer out there is hoping for Nintendo to release the Wii version of the Zapper that was released for the NES. Until that day comes, gamers will have to rely on 3rd party peripheral manufacturers to fill that void. 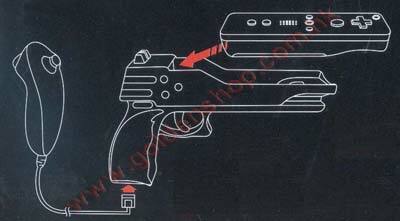 PEGA has released their light gun attachment for the Nintendo Wii. Its simply just a casing that lets you plug your Nintendo Wiimote and Nunchuk into it. It has an actual trigger. When you press on the trigger, there is a spring inside that will retract a trigger that will press the B button on the Wiimote. Where do you plug the Nunchuk controller? You plug it at the bottom of the light gun. How well does it work? When the controllers are connected to the light gun attachment, it works pretty well. The Wii picks up every movement as if it wasnt in the attachment. Bad thing about it? When pull the trigger, you have to pull all the way in order for the trigger arm to press the B button. When pressing the button, your hand will jerk a little as you will need a bit of strength to pull the trigger. This will cause your aim to be inaccurate. Conclusion : Overall, the Wii Light Gun is a great idea and a temporary solution until Nintendo releases their own (whenever that will be). The distance of the trigger arm to the B button is it bit far which means you'll have to pull the trigger even further. By that time, you've already been hit or will be missing your shots. It would have been nice if the trigger arm was closer to the B button which wont take long to pull the trigger. When placing the Wiimote into the attachment, you will need to remove the wrist strap. If you are using a controller glove, you'll have to remove that as well.